Commercial versions of ActivityMon allow to distribute activities data to remote locations. Using this feature activities data can be viewed without the physical access to monitored computer. First of all choose the computer you want to collect monitoring data on. Create the user account on this computer (or in domain the computer belongs to) under the which activities data will be stored. In the shown dialog folder has to be checked as shared. It is also needed to give the access to the folder to the user we created. User must have access rights for read and write. 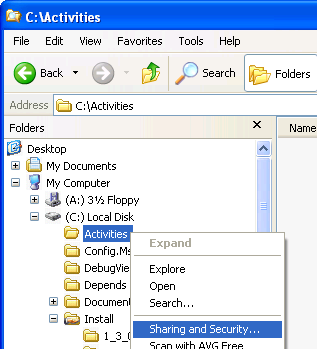 To distribute activities data into the created shared folder from monitored computers copy channel has to defined. 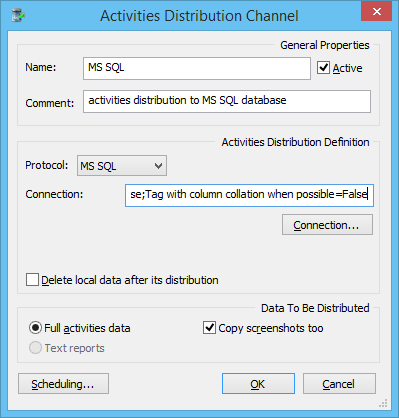 Copy channel definition is a part of application settings, namely on the Data Distribution page. where benji is the name of computer and Activities is the name of shared folder you have created. Also you have to enter the name of user to copy activities data under into the Login: textbox. User account password has to be entered into the Password: textbox. - if monitored computers are not running over the night it has no sense to schedule copy channels, let's say, on 3 o'clock in the morning. With such a settings no activities data will be copied. - when activities data distribution after time interval scheduling is used we do not recommend to use time interval below one hour. Remark: in case of problems with the activities distribution within the LAN shared folders check the access rights on the system temporary files folder (typically C:\Windows\Temp). NETWORK SERVICE user account must have read&write access to it.